Figure 3 Integrated multitrophic open cultivation model of salmon, Japanese oysters, giant kelp, and abalone developed in southern Chile with the support of the National Science Agency of Chile (FONDECYT grant Nr. 1050550). 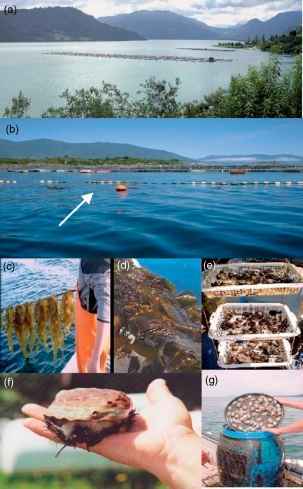 (a) Salmon cages in southern Chile; (b) salmon cages surrounded with kelp long-lines (white arrow); (c) one-month-old kelp (Macrocystis) seeded on lines; (d) high-density kelps before harvesting; (e) Japanese oysters (Crassostrea) cultivated in trays; and (f) red abalone (Haliotis) cultivated in 200 l containers at sea that recycle the seaweed produced (g). nutrient reduction services provided by these organisms would be recognized and valued. Another example has suggested that the internalization of the environmental costs of only the nutrient loading of N and P by salmon farming in Sweden and Chile could raise production costs and develop a very unattractive commer cial situation. However, with an IMTA approach, the nutrient loads being introduced to the environment can be reduced significantly by using extractive species and sal mon aquaculture can still remain economically profitable. As in the Western world monoproducing companies remain the most common, another limitation is the lack of aquaculture diversification. Diversification of aquaculture should not only mean new species of carnivorous fish, but also that diversifying aquaculture toward the use of extrac tive species and novel products would increase their market value. 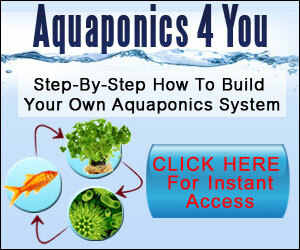 In general, filter feeders and seaweeds have a low price in comparison to finfish and shrimps. Their low price limits the development of a massive global IMTA industry, and its existence remains mostly at a local and low-medium scale. However, if market conditions were modified, the situation could also be modified dra matically. For example, mussel culture in Spain has suffered during the last few years mainly due to the impact of HABs driving their prices up. In only a few years, the situation in Spain facilitated a shift of the industry to the south of Chile from a local production of 28 7131 of mussels per year in 2000 to a production of over 87 7361 in 2005, transforming the coastal landscape (Figure 1). However, still the main constraint for the development of IMTA in Chile is the capacity of the Chilean government to modify its regulations and adopt an adaptive integrated coastal zone management approach that would allow a sustainable development of salmon, shellfish, and seaweed aquaculture.